Blogs are always a great addition to any website. They provide information in a manner that is easily understandable to the reader. Additionally, blogs can make it easier for you to optimize your website for the search engines. The performance of the blogs is a big determinant to the success of your overall SEO campaign. Your blog posts should be getting read and shared on a regular basis for your SEO to be successful. They should fetch you a lot of quality links as well. If your blogs are unable to do all of these things, then they are failing at their work. You may feel that you are wasting your time completely. There can be a diverse array of causes for the poor performance of your blog. Your blogs may not be easily located. It may also be possible that you are not providing a satisfactory user experience to the reader. These can make you struggle when you are trying to garner a good readership. It will more difficult for you to get backlinks and shares on social media networks. It is important that you keep certain factors in mind when you are creating content for your blog. Through the implementation of these factors, you will find that your blog has become indispensible for your business. Simply writing a blog is not enough. Add some links in the content of the blog. The links you place should be collected from websites and blogs that are related to the content of the blog. The sources should be of a good quality. Develop a good relation with other blogs and interact with them regularly. Link your own blog with them and they will do the same for you. Avoid placing a huge chuck of text. Break it up into smaller pieces by the use of paragraphs. It makes the blog look neat and easier for people to read it. Attach a few images to the blog to make it more interesting. The images should be related to the content, of course. Use headlines and bold text when necessary to create emphasis on important points. Bullet points can be used for the same effect. Lay out the content in a way that makes it look engaging and concise. The reader should be able to simply scan the page and still get the same information as another reader who reads it thoroughly. Add a number of social networks buttons to the blog so that the reader can share it faster. You can opt for a complete range or use the most common social networks for the buttons. Take time to respond to the comments left behind and engage with your readers. 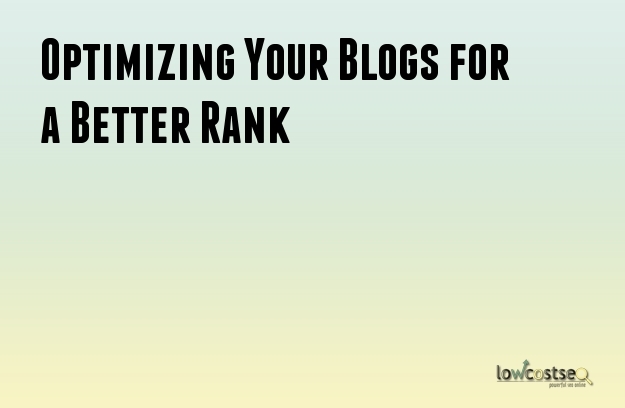 Share your own blog post on the various social networks to get more people to notice it. Statistics have shown that websites which use blogs garner more visitors. Moreover, blogs are quite easy to implement due the variety of content that can be posted on blogs.